(Newser) – Home life not going so well? Just rob a bank and get yourself relocated to jail. 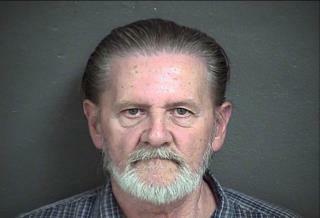 That's what a 70-year-old Kansas man allegedly did Friday, the Kansas City Star reports. Police say Lawrence John Ripple walked into Kansas City's Bank of Labor and gave the teller a note reading, "I have a gun, give me money." But after getting almost $3,000 from the teller, police say, Ripple sat down in the bank lobby and told a bank security guard, "I'm the guy you're looking for." The guard took the money and held Ripple there until police arrived. Later, while being questioned, Ripple allegedly explained to investigators that he'd had a fight with his wife and that he "no longer wanted to be in that situation." Washington Post reports that a judge hindered his grand scheme on Wednesday by releasing him on his own recognizance. . . Talk about cruel and unusual punishment, sending the man back home. He went from one prison to another.